Powerful photo editing made simple. From basic photo editing to doing the coolest things with your photos, Amazifier makes it simple, fun and easy. Adorn your photos with stickers, text and customized seals. Create masterpieces with photo effects, that can be artistically brushed as you please. Transform how you look with our touch up suite. Email a photo post card, print a photo calendar or greeting card or publish it to your facebook wall! Try our Touch-up suite and transform how you look, remove red-eye or whiten teeth. The touch-up suite includes full make-over capability such as applying lip color, blush, hair color and eye color. Put the perfect finishing touch to your photo by adding one of our professionally designed photo frames. ..and when you're ready with your 'photo make-over' show it off to friends and family with ease. 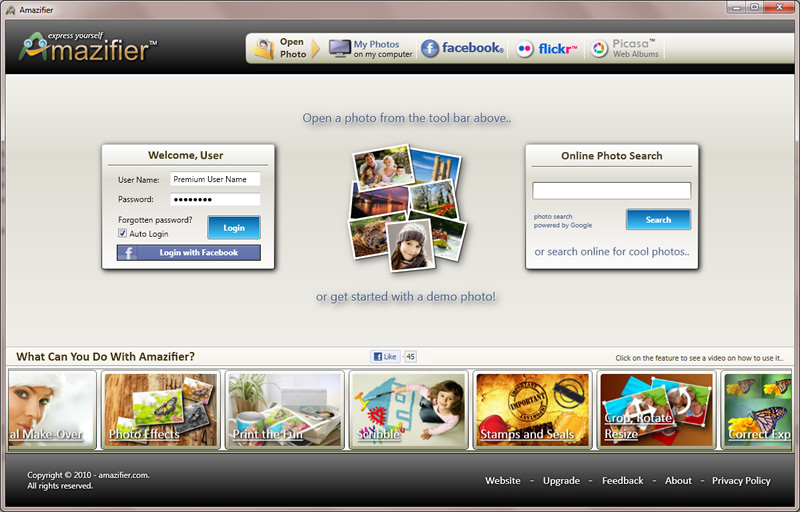 Email a photo post card, print a calendar or greeting card or publish it to your facebook wall. - it couldn't get any easier or more fun! Qweas is providing links to Amazifier 1.5.6.0 as a courtesy, and makes no representations regarding Amazifier or any other applications or any information related thereto. Any questions, complaints or claims regarding this application Amazifier 1.5.6.0 must be directed to the appropriate software vendor. You may click the publisher link of Amazifier on the top of this page to get more details about the vendor.